From the air these produced water holding ponds look like oddly out of place fountains. 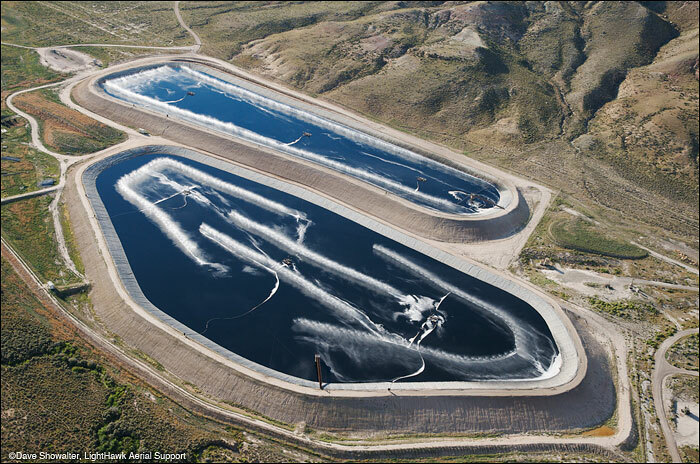 In reality, they hold produced water that has been pumped from natural gas wells. The water also includes the highly toxic chemical fracking fluid, including numerous cancer-causing chemicals. Aeration facilitates evaporation, leaving chemicals in the ponds. LaBarge Natural Gas Field, Wyoming. Photo © copyright by Dave Showalter.